Consecrated men and women in the Archdiocese of St. Paul and Minneapolis came together at St. Mary’s University Center in Minneapolis Sept. 13 to celebrate the Year of Consecrated Life through prayer and art. 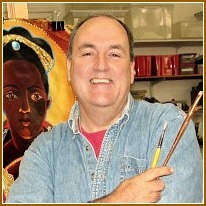 Brother Mickey O’Neill McGrath, an artist and Oblate of St. Francis de Sales, gave two talks for the “Day of Prayer with Members of Consecrated Life.” His presentation connected beauty, creativity, art and prayer. McGrath’s first talk showed his illustrations of the lives of religious women from St. Hildegard of Bingen to Sister Thea Bowman. He also showed a series of paintings on modern artist Henri Matisse and his friendship with the Dominican Sister Jacques-Marie. He reflected on the women and sisters who had influenced his own life, including his mother and his first-grade teacher, Sister Miriam, an Immaculate Heart of Mary sister. His middle name, Louis, honors his aunt, Sister Mary Louis, a Sister of St. Joseph. “I learned from them the presence of God and how calming that can be,” he said. An artist since he had been a preschooler drawing under his mother’s ironing board, McGrath shared how art and creativity could become a spiritual path to finding the presence of God and bringing it to the world. McGrath pointed out that despite living through two world wars, Matisse intentionally produced paintings that were colorful and joyful. He said Matisse had wanted his art to be for people who saw it “like sitting in an easy chair” at the end of a hard day. “That is what meditation is about — you’re giving an easy chair for God in your heart,” McGrath said. He also pointed out how art is a cultural revolution in a society of technology, progress and constant motion. “Miracles are happening every moment,” but technology prevents us from seeing it because it distracts one from the present moment, he said. “This is always about the next thing,” he said, pulling out his smart phone. “That’s why creativity is healing. It’s not about the product, it’s about the process,” he said, adding that when immersed in the creative process, one lives in the moment, which is where the presence of God is found. A panel gave brief responses to McGrath’s talk. Members said his presentation had led them to reflect on their own families, the importance of living in the present moment and the Incarnation.